Janelle has recently moved from Melbourne to Ballarat for a Tree Change. She is a seasoned all-rounder in all aspects of Real Estate obtaining her Agents Representative Licence in 1998! With 15 years’ experience in Property Management under her belt, Janelle brings a wealth of knowledge to Titheridge Real Estate & believes in good old fashioned customer service. 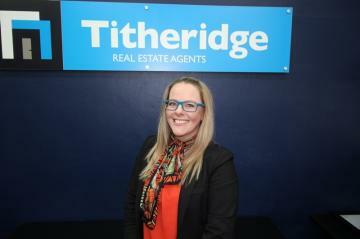 Janelle will work alongside Robyn Titheridge in the Rental department. Very spacious one bedroom apartment situated in one of Ballarat's prestigious apartment blocks. Very clean, neat and tidy with very bright, large open living area and huge bedroom. Front unit on 1st floor overlooking Drummond Street. Gas cooking. Single carport. Inner city living at its best. NO PETS AND NO INTERNAL SMOKING. This spacious two storey townhouse offers modern, low maintenance and convenient living. The open plan living area adjoins the kitchen which offers all of the modern conveniences including dishwasher, gas cook top and electric oven. There is ample cupboard space and storage under stairs. Separate toilet and laundry downstairs and there is direct access into the single remote garage and an extra car park space. Upstairs has the bright spacious master bedroom with WIR and en suite, with views overlooking the complex. The 2nd and 3rd bedroom both have BIR's. A second bathroom with a large shower, bath, vanity and toilet. Also consisting of a study nook at the top of the staircase and a huge walk in linen/storage cupboard. The home has a split system for heating and cooling along with a ceiling fan at the top of the stair case. The low maintenance gardens with private paved courtyard complete a trendy property. Inspection is a must! This exceptionally located 3 bedroom home in the Ballarat High School precinct offers a modern kitchen with DW, Gas stove top and Electric oven. The master bedroom features WIR and ensuite with shower, toilet and vanity. The 2nd and 3rd Bedrooms offer large BIRs. With 2 living areas and separate dining area this home is very spacious. The main bathroom has separate shower and bath and separate toilet. Externally the home offers a large lock up garage, a single carport and veggie-patch. Book an inspection to ensure you don't miss out! Very neat & tidy 4 bedroom Brick Veneer home. Separate entry, lounge with Rinnai gas heater. Renovated kitchen and gas cooking, dishwasher. Study or small 4th bedroom, Master bedroom with BIRs and ensuite, BIRs to 2nd & 3rd bedroom. Bathroom with separate toilet and laundry. Gas wall furnace in passage. Paved courtyard and single carport. Very close to schools, public transport and shops. INSPECTION BY APPOINTMENT ONLY - INSPECTION WILL ONLY BE CONFIRMED TO REGISTERED ATTENDEES. Immaculate two bedroom unit in a great location. All gas appliances, enclosed yard and a single garage. Very clean, neat and tidy with a good sized living area. Open living/dining room with feature cathedral ceilings, modern kitchen with electric oven and gas cooktop. Three spacious bedrooms all with built in robes. Updated bathroom, laundry with second internal toilet. Under floor gas central heating, gas heater in lounge. Entertainment area, double garage with rear roller door and enclosed rear yard. Great location schools and shopping precinct very close by. NO PETS Please note: Inspection on this property will commence from 3rd January 2018. Situated in close proximity to Lucas shopping and Medical Centre with over 20 squares of living area plus large double garage and Alfresco area. Modern including neutral decor, separate entry, large open living with well appointed kitchen including dishwasher, gas cook top and electric wall oven. Large dining and family room, and spacious separate lounge room. Master bedroom with walk in robe and ensuite. Three other bedroom all of generous size and built in robes. Spacious family home with 4 bedrooms including master with ensuite and WIR. Hugh open living area, kitchen and dining room. Kitchen with dishwasher, gas cook top and electric wall oven. Family bathroom with shower, bath and separate toilet. Double garage and fully enclose side yard. Other features include brand new carpets throughout and central heating. Situated close to Ballarat High School, Popular Primary Schools, Aldi Supermarket and shopping precinct.